I’ve mentioned before that Benjamin Gettler served on the Board of Trustees for the University of Cincinnati, but I haven’t really talked about how he got there or what that means. In short, the Board of Trustees is the governing body of the University of Cincinnati. There are 11 members total, who are recommended by the Ohio State Senate and appointed by the Governor of Ohio. Among other responsibilities, they select and appoint the university president, set the university budget, and grant all degrees from the university. The trustees set the framework for students’ experience at the University of Cincinnati, as they also are responsible for setting the tuition and approving university rules, curricula, and programs. Gettler himself was key to the creation of the Judaic Studies Department. Gettler was first recommended as a trustee to Governor George Voinovich by legislator Stanley Aronoff in October of 1992. Aronoff lauded Gettler’s commitment to the Republican Party (Voinovich was a Republican governor) and business prowess, but it wasn’t until November of 1993 after a second recommendation from Bob Taft, that Voinovich would finally appoint Gettler. Taft’s recommendation better highlighted Gettler’s qualifications as both a University of Cincinnati alumnus and significant donor. Taft also praised his experience in law, finance, community service, and business in addition to his supportive activities with the Republican Party in local, state, and national issues. He also put his own reputation on the line by making the recommendation out of personal familiarity with Gettler. 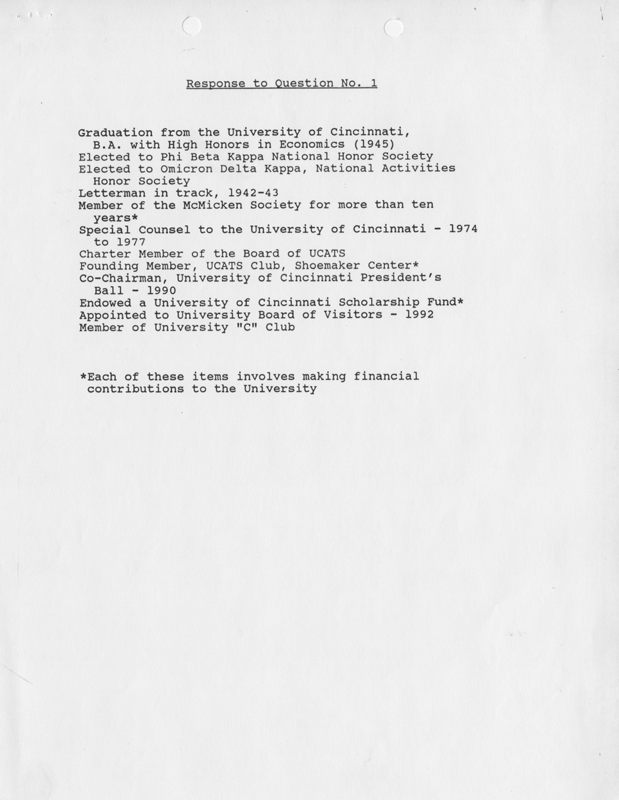 The following January, Voinovich contacted Gettler with a letter, asking him what services he previously performed for the University of Cincinnati, his motivation for serving as trustee, the existing problems he saw at UC and in higher education and how he would solve them, and how he felt a trustee should relate to the president of the university, who at that time was Joseph Steger. He also told Gettler what his expectations were for a trustee, including time commitments, accountability, and legal compliance. Gettler replied very shortly after, carefully answering each of Voinovich’s questions. Gettler stated that his two main concerns with the university were financial in nature, including an organized faculty represented by a collective bargaining agreement. He believed the financial issues could be improved with his experience as Chairman of the Board of American Controlled Industries and at Vulcan, and that as a legal representative for the Board of Trustees when the American Association of University Professors first established the faculty union, he had a deep understanding of the relationship between the board and the faculty. It should be noted that at the conclusion of this project, the use of Gettler’s papers by scholars, students, faculty, and the general public will now facilitate an objective assessment of his relationship with the University of Cincinnati faculty. 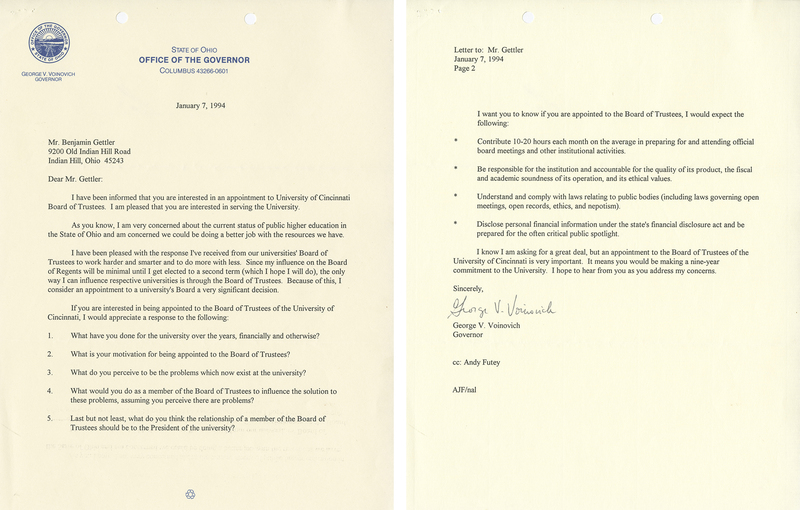 So on January 19, 1994, Gettler was notified by letter from Voinovich of his appointment to the Board of Trustees at the University of Cincinnati. He served his full term until 2003, only missing a single meeting in all those years. He served as the chair of the board from 2000-2002. During his service, he continued correspondence with Bob Taft, who later would become Governor of Ohio, and George Voinovich, who went on to serve on the United States Senate. 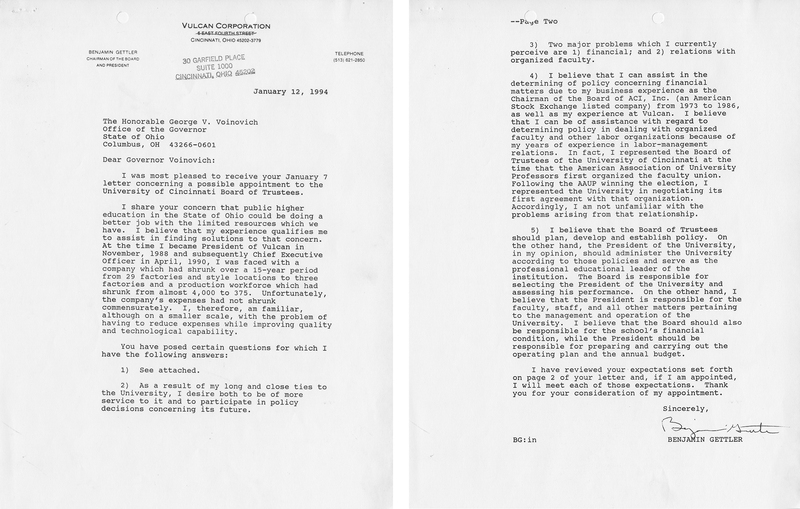 This correspondence can also be found in the Benjamin Gettler Papers Collection.